Why a Celtic engagement ring? it's time to find the perfect Celtic engagement ring for her. Read on to discover the history and symbolism behind the engagement ring, the designs that distinguish Celtic engagement rings from others, and where to find the best quality and value when you're ready to buy. Have you ever wondered why engagement rings are worn on the third finger of the left hand? The reason is because it was commonly believed at the time that the most direct route to the heart was up the left arm and that if you followed the most direct route from the heart it would bring you to the third finger on your left-hand. Thus, as both the heart and the engagement ring are symbols of love, it seemed fitting that the engagement ring be worn on the third finger of the left-hand. The circular design is a symbol of eternal love as well. Celtic engagement rings are distinguished by their designs, which take the symbolism of the engagement ring further and bring Celtic symbolism into the picture as well. Although the Celts did not leave details about their culture in writing, they did leave an immense array of artwork. Derived from this huge amount of wonderfully diverse Celtic artwork comes the design of the Celtic engagement ring. 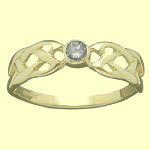 The most popular Celtic designs used in engagement rings are Celtic knotwork designs. Celtic knotwork is believed to symbolize the infinite nature of time, the eternal spiritual growth of each living soul, and the interconnection and infinite nature of all living creatures. Celtic knotwork uses two continuous, unbroken loops that are intertwined and inseparable from each other. As the lives of the bride and groom are merged in eternal unity and fidelity, so are the circular strands inseparably bound together for eternity. So, each strand of a Celtic engagement ring has come to represent the permanence and continuation of love, life and faith. As Celtic knotwork jewelry experienced rising popularity in the 1990s, largely due to the success of Riverdance, brides-to-be everywhere began yearning for engagement rings that would testify to their passion and heritage. Soon, Celtic engagement ring designs became very popular as well. Now, a decade later, Celtic engagement rings are often designed with more modern aspects, such as a design with a diamond in the middle. Due to their rise in popularity in the late 1990s, many jewelry shops now stock some form of Celtic engagement ring, especially in Ireland, Scotland, Wales, and England. However, if you can't find a shop with a design you like, perhaps you could ask a jeweler to make one for you. Be warned, though, this option may be very expensive! If you decide to have one designed especially for your bride, be sure the person you're working with is a very experienced Celtic jewelry designer. Another option would be to get your bride's ring size and order her ring from one of several established Celtic jewelry shops online. Shopping on the web opens up a much wider variety of choices and you'll have a better chance of getting her an authentic Celtic design at a very good price. Why? Because most of them sell their own designs...no middleman = lower cost. When buying your bride's engagement ring, settle for nothing less than high quality and excellent value for your money! After all, what more could the sensible, discerning bride want in her new husband? Leaves more money for the honeymoon anyway! My choice for the best place to buy your lady's Celtic engagement ring online is Irish Celtic Jewels. A diamond engagement ring is every girl's dream. But your bride's ring will really stand out if her ring also has Celtic knotwork or the Claddagh surrounding her diamond. My favorite Celtic engagement rings at Irish Celtic Jewels are the two diamond engagement rings with emeralds. The combination of emeralds, diamonds, and Irish design come together beautifully to form the quintessential Irish Celtic engagement ring! All the rings from Irish Celtic jewels are individually tested and hallmarked by the national assay office at Dublin Castle. So you can take pride knowing your bride's engagement ring from Irish Celtic Jewels has been certified as authentic Irish engagement ring. The only small downside to buying from them is you may have to be patient. Their rings are not just sitting in a warehouse waiting to be packed and shipped. Instead, your order is crafted after you order it, which takes a few weeks. But remember, good things come to those who wait! Once your order arrives, you'll be glad you waited. You'll have an authentic diamond Celtic engagement ring handcrafted by a traditional artisan in Ireland...priceless! This store is really special. Their love and respect for Celtic culture fills each and every page - from the descriptions of their merchandise, to sorting their products according to mystical Celtic themes. The Celtic Store is one online shop I particularly like. Although this is "Fantasy-Ireland" and they are from Scotland, I was impressed by the wide selection of Celtic rings they had. Compared to jewelry prices at your local shopping mall, I think you'll be pleased with the prices on this website.